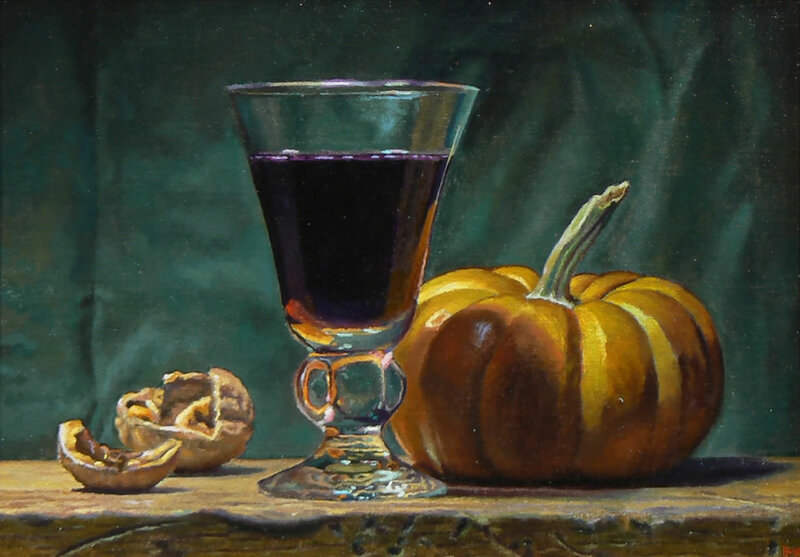 Walnuts, Wine, and Pumpkin, by Jeffrey Hayes. The pumpkin is a strange fruit, hard to penetrate, full of soggy fiber and seeds, with a hint of sweetness (or at least a suggestion that it would be open to some sugar) but also a touch of sour in some varieties. It’s a challenge in the kitchen. When I was a kid growing up on the North Shore of Long Island, there were still lots of pumpkin fields, some right near my house. We’d run through them each fall, by the alluring rows of orange balls that looked like they had landed from another planet. Of course we’d smash a few and steal a few, and when we got them home we’d have no idea you could actually cook them (the pumpkin you ate came in cans, right?). We’d just make jack-o’-lanterns, or throw them at cars (oh, those carefree days). Sadly, most of those pumpkin fields are now gone, replaced by mind-numbing rows of ranch houses. Not long after pumpkins and other hard-skinned squashes reached Europe from the New World, Italians, especially poor ones, figured out good ways to cook them, making ravioli, risotto, gnocchi, and savory tarts like the absolutely delicious torta di zucca from Liguria that I often make for Thanksgiving. (Here’s my recipe.) 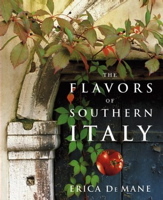 Italians were undeterred by the fruits’ hard, grooved surface and by the torment of breaking them apart in a civilized fashion. 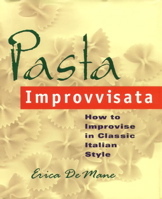 Italian-Americans have, for the most part, decided it’s not worth the effort. I’ve cut myself a bunch of times when my knife slipped off a pumpkin skin, causing a shockingly bloody mess. The things can be trouble. There’s a Sicilian dish, one that’s an acquired taste, that I mention when people ask me how Southern Italians deal with pumpkin. To make it you need to peel and slice a pumpkin, then sauté it with garlic, vinegar, sometimes a bit of hot chili, and fresh mint. In my opinion its taste is strange, but it makes sense served as a side with salumi, cutting through the pork fat with its soured up vegetableness. It’s a stretch on the agro-dolce (sweet and sour) treatment (though light on the dolce) that works so nicely with fish or rabbit or eggplant. If you’d like to give it a try, you can find my recipe here. When I decide to go for it and cook pumpkin, I’ll buy a hacked off piece at the Greenmarket. I look for pieces of cheese pumpkin, since its skin is smoother and easier to get rid of than that of the deeply grooved varieties. It also has less fiber and a richer texture than the common jack-o’-lantern. Pumpkin chunks are easy enough to bake, if you want to wind up with a purée, but for slices, you’ll need to peel it. Frankly, often I’ll just use a butternut squash and forget the pumpkin. Butternut is more one-note, not as complex tasting but easy to ramp up, especially with fatty pork things like sausage or pancetta, and also with herbs and spices. With butternut squash I look for ones with long necks. I separate the neck from the round seeded part, keeping the round part to roast. You can easily cut a slice off the top of the neck, stand the thing upright, and just work down with a sharp knife, removing the skin. Then you cut it into slices or cubes, depending. No seeds to deal with. A really good dish is pumpkin lasagna. I had one last month at Ai Tre Scalini, a hip, fairly new trattoria in Rome. It seemed to have some mascarpone worked in, and a parsley pesto drizzled on top after baking. I figured out my own version. It tasted oddly different from the Roman one, but in a good way. Maybe it was my addition of sage, or possibly the type of pumpkin (I used a cheese pumpkin). I’m not sure what kind of pumpkin Ai Tre Scalini used. If you ask an Italian what sort a winter squash or a pumpkin is, they always say it’s zucca. It’s all zucca over there. Here’s a vegetarian fall lasagna, a good first course for your Thanksgiving table but also great on its own. You might follow it with a green salad that contains touches of bitterness, such as a chicory, arugula, or escarole one, to contrast with the squash’s slight sweetness. Preheat the oven to 425 degrees. Coat 2 sheet pans with a little olive oil. Place the pumpkin or butternut squash slices on the pans. Mix the balsamic vinegar with about 1½ tablespoons of olive oil, and brush it onto the squash slices. Season with salt and black pepper. Bake until just tender, about 15 minutes. While the squash is baking, make the pesto: Put just enough water in a saucepan to cover a handful of herbs, and bring it to a boil. Drop in the parsley and sage, and blanch for about a minute. Pull the herbs out with a strainer spoon, and run them under cold water to set their green color. Squeeze out as much water as possible. Put the walnuts and the garlic in the bowl of a food processor, and grind them to a rough chop. Add the parsley and sage and little salt, and pulse until the herbs are chopped. Now drizzle in about ⅓ cup of olive oil, and pulse until you have a fairly smooth paste. You should be able to drizzle it, so if it seems too thick, work in a tablespoon of warm water. Sauté the leeks in a little olive oil until they’re soft and fragrant. Pull the pan from the heat, and add the mascarpone, the mace, and some salt and black pepper. Stir well until the mascarpone melts. Boil the lasagna sheets in the usual way. Choose an approximately 8 x 12 inch lasagna dish, and drizzle a little olive oil in the bottom (I used an equivalent oval dish, for a less formal look). Lay down a layer of pasta. Add a layer of pumpkin (or butternut squash). Drizzle on some of the mascarpone mix. Dot the top with pesto, and sprinkle with the grated cheese mix. Put down another layer of pasta, and top it with a layer of all the remaining squash, a little more mascarpone, and a bit more of the grated cheese. Drizzle on a tiny bit more of the pesto, saving about 1½ tablespoons for later. Add a final layer of pasta, put down the remaining mascarpone, and a rest of the grated cheese. Give the top a few grindings of black pepper. Bake, uncovered, until the top is golden and the lasagna is bubbling, about 20 minutes. Pull the lasagna from the oven, and drizzle on the remaining pesto. The lasagna doesn’t need to rest, since it isn’t very liquidy, so you can serve it right away. I have found that a hatchet works well to make that first cut into a hard pumpkin. But, better yet, and possibly safer, I discovered that baking whole, those small(er) pumpkins, seeds intact, imparts into the flesh a most delicious nutty flavor. In fact, I roast all my squashes whole, as I find that flavor wonderful! Do try it! The scent of the baking squashes fills the house with a satisfying aroma that whispers comfort. Don’t forget to poke a few holes into the squashes first. Use a hammer and nail if the that outer skin is too hard to poke a knife into. 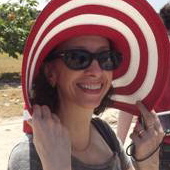 Laurie, I like the hatchet idea. I do roast pumpkin and other hard squash all the time. The hard part is when I want to wind up with firm slices or chunks, not a soft texture. That’s when I turn to butternut squash since they’re so easy to peel. This sounds wonderful! Can’t imagine diving into turkey afterwards, though…!